Commissioned by Arts Council England, we're exploring ways cultural organisations are revolutionising their engagement with communities. The result is both a practical toolkit and a growing compendium of best practice. The term Cultural Democracy describes an approach to arts and culture that actively engages everyone in deciding what counts as culture, where it happens, who makes it, and who experiences it. It is not a new concept, but it’s one that seems to be gaining focus across arts and culture. It’s also often misunderstood or misused in the cultural sector. 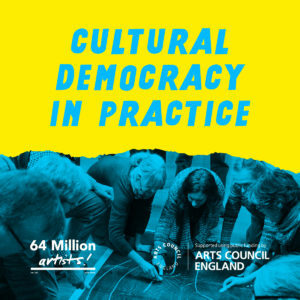 We were commissioned by Arts Council England, to explore practical ways cultural organisations are being most innovative in this area, to share this practice and collect case studies of projects which embed Cultural Democracy at their heart. Contact us at hello@64millionartists with recommendations for further case studies. With this publication we hope to share examples of the excellent work taking place across the funded sector, highlighting best practice , and contributing to the case for Cultural Democracy and the potential benefits of open decision making, co-creation and co-production for arts organisations and their communities.